So November 3rd 2015 is in the books and as the dust settles from the election it looks like the attacks, stumping for allies from the elected dais and misuse of public funds to influence voter perception only worked out in a small way. 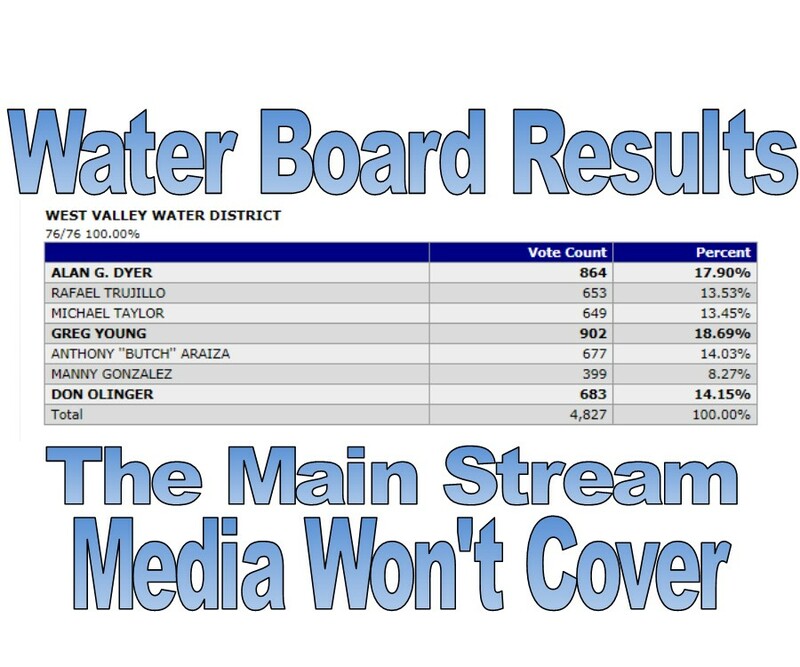 Directors Linda Gonzalez & Clifford Young along with appointed Director Rafael Trujillo used questionable tactics to influence the look of the West Valley Water Board by supporting three candidates (Greg Young, Manny Gonzalez & Rafael Trujillo) and using public funds to hurt the campaigns of Alan Dyer & Butch Araiza. In the end only Greg young seems to have risen to the top of the pack followed closely Alan Dyer and Don Olinger. If the results remain the same these three men will be the your elected Board members for the 2015 Election. Greg Young may be the first candidate to garner support from the FAR left and FAR right wing groups that make up politics here in the Inland Empire. Greg Young has had strong support from the EXTREME left wing Democrat Club in San Bernardino and via social media strong Tea Party Activists like Tressy Caps and Kathy Ponce are celebrating Mr. Young’s winning of the Water Board Seat. So it looks like pigs are now flying and Hell has frozen over because nobody ever thought that these two groups could ever agree on anything let alone a political candidate. What stands out to us is the constant struggle that Rafael Trujillo finds himself in trying to get ELECTED to any political position in the Rialto Region. He lost for city council, unable to secure a council appointment, failed to defeat Joseph Williams for the Community College Board and failed this election even though he was able to find a short lived appointment on the West Valley Water Board for a month. What is sad is a lot of people have dumped a lot of political influence and pressure into getting him elected to something and it has not worked. Jim wrote about how the drought alone doesn’t draw people in and that people don’t engage with our elected water bodies. What he fails to address is that water boards and utility commissions treat the general public like idiots when we don’t like or agree with their given course of action. They treat the public as though we are uneducated and not worthy to input our thoughts on their out of control actions. So where is the Sun on these issues? Why isn’t the media covering Rialto at all? Don’t the people paying to get the Sun in Rialto deserve to be just as informed about Rialto as they are about Los Angeles?